NASA's Mars rover Curiosity took this self-portrait, composed of more than 50 images using its robotic arm-mounted MAHLI camera, on Feb. 3, 2013. 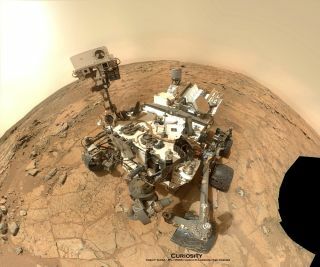 The image shows Curiosity at the John Klein drill site. A drill hole is visible at bottom left. Some pieces of rock that fell to Earth from space are indeed from Mars, new measurements reveal. New data collected by NASA's Mars rover Curiosity has pinned down the exact ratio of two forms of the inert gas argon in the Martian atmosphere. These new measurements will not only help confirm the origins of some meteorites, they could also help researchers understand how and when Mars lost most of its atmosphere, transforming from a warm, wet planet to the red desert it is today. Scientists have identified meteorites, such as this one nicknamed 'Black Beauty,' as Martian in origin. "We really nailed it," Sushil Atreya of the University of Michigan and lead author of an Oct. 16 paper reporting the finding in Geophysical Research Letters, said in a statement. "This direct reading from Mars settles the case with all Martian meteorites." Curiosity found that the argon ratio for Mars is 4.2. The lighter form of argon has escaped more readily than the heavier isotope, NASA officials wrote in a statement. If Mars had not lost atmosphere through the course of its planetary history, its argon ratio would be 5.5 — the same as the sun and Jupiter, two cosmic bodies with so much gravity that isotopes cannot escape, NASA officials said. The rear of the stone from the Tissint Martian meteorite is almost completely covered with a glossy black fusion crust. Before this new study, scientists had placed the argon ratio somewhere between 3.6 and 4.5 by analyzing gas trapped inside Martian meteors on Earth, but one of Curiosity's precise instruments — called Sample Analysis at Mars (SAM) — allowed NASA researchers to find the more exact proportion. "Other isotopes measured by SAM on Curiosity also support the loss of atmosphere, but none so directly as argon," Atreya said. "Argon is the clearest signature of atmospheric loss because it's chemically inert and does not interact or exchange with the Martian surface or the interior. This was a key measurement that we wanted to carry out on SAM." Although Curiosity is unable to directly investigate how much atmosphere Mars is losing, NASA's next Mars mission is designed to do just that, officials with the space agency said. The MAVEN spacecraft (the name is short for Mars Atmosphere and Volatile Evolution Mission) will launch toward the Red Planet in November. NASA's Mars rover Curiosity has been roaming the surface of the Red Planet since it landed in August 2012.